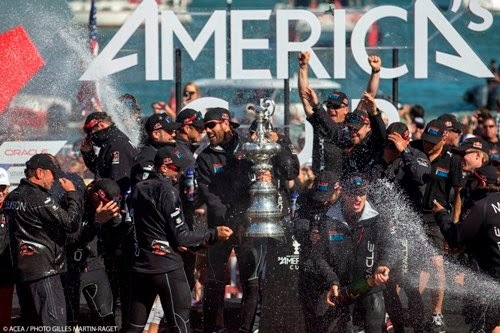 Oracle Team USA staged a massive comeback to win the 34th America’s Cup in a winner-take-all 19th race, defeating challenger Emirates Team New Zealand by 44 seconds in Wednesday’s clincher. Led by 35-year-old skipper Jimmy Spithill, ORACLE TEAM USA won by the score of 9-8. But even though the America’s Cup has concluded in dramatic fashion, San Francisco Bay will continue to host high-intensity sailing this week with the four-day Rolex Big Boat Series scheduled to start today (Thursday, Sept. 26). 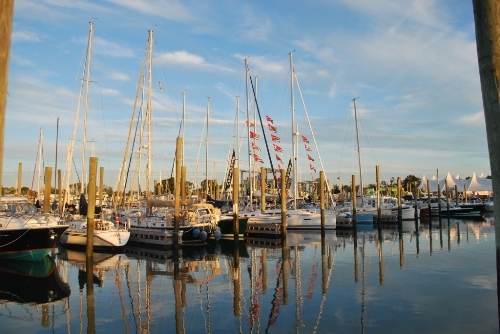 The annual regatta is in its 49th running. 24/09/2013 - San Francisco (USA,CA) - 34th America's Cup - Final Match - Racing Day 14. If you haven't been following the America's Cup action in San Francisco all that closely, you may find it hard to believe that the contest has come down to a winner-take-all race today after Team USA was losing so badly early on. Oracle Team USA has staged an improbable comeback from 7 points behind after sweeping both races on Tuesday in the 34th America’s Cup. 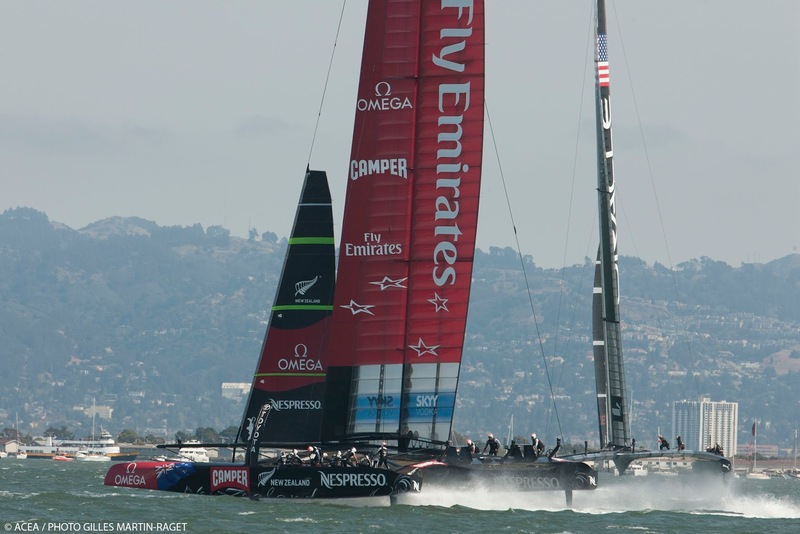 Oracle has had no margin for error as Emirates Team New Zealand has been a point away from winning the whole thing for several days running. 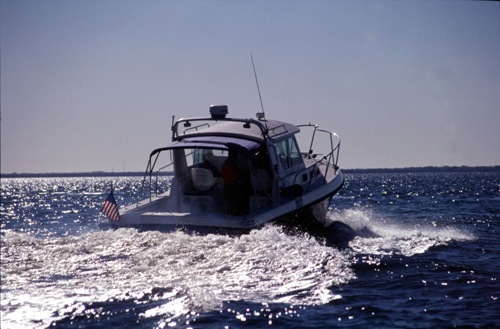 There may be a lot of boat shows this weekend, but lucky for us one of the largest in the United States is going on right in our own back yard in Southeastern Connecticut... 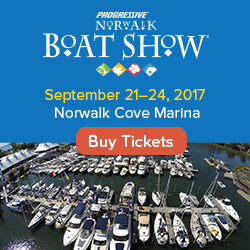 It's the Norwalk Boat Show. 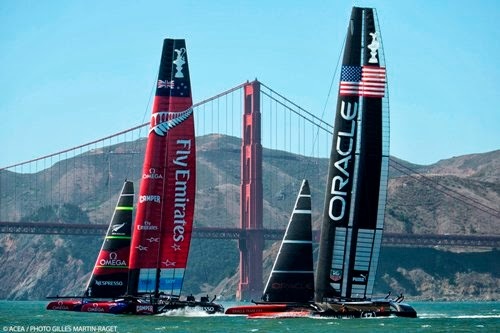 ORACLE TEAM USA won Race 8 in San Francisco on Saturday after trailing off the start line and at the first two mark roundings, thanks to a near capsize by Emirates Team New Zealand on the 3-nautical-mile upwind leg. After losing another race, Oracle Team USA, which began defending the America's Cup "in the hole" with a two race penalty, requested extra time to regroup yesterday. 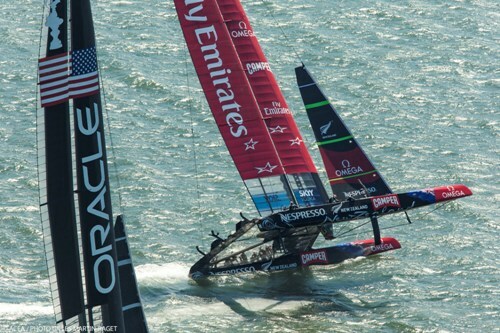 Emirates Team New Zealand now leads the America's Cup four races to zero in the best of 17 series. 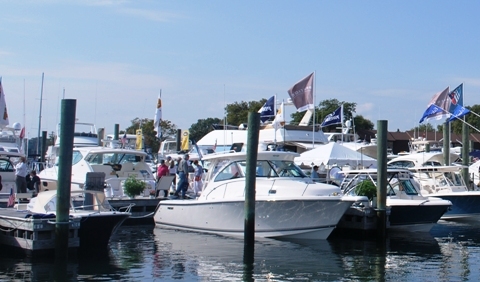 Don't worry, the big flurry of shows is right around the corner - a corner that's going to be even more crowded next year when New York steps into the game with a new fall boat show. Or perhaps it will be less crowded as the fate of the annual Annapolis sail and power boat shows is undetermined due to a change of ownership earlier this week. Screen shot taken from YouTube video by Ajay Jaafar. Couldn't stop watching this video when we came across it. 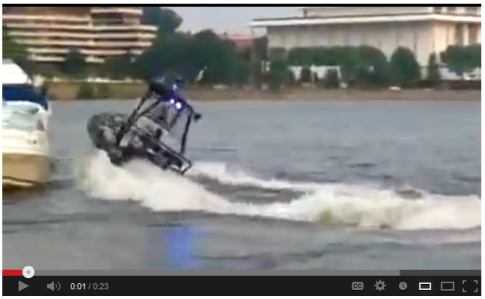 This is a good lesson for new boaters about how boats turn at high speeds. It can be like driving a car on sand or an icy road - a sharp right turn of the wheel may point the front of your vehicle in the expected direction, but the rear or entire vehicle may still continue to slide to the left. 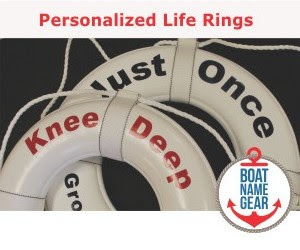 Of course, substitute starboard, bow, stern, and port, respectively, when specifically referring to boats. The person who caught the video on his phone stated that he was walking by the Potomac River and noticed two police boats. When the first one took off with sirens blaring, he started filming the second boat just in time to catch it crashing. When you do a search for the word "boating" on Google News on the day after Labor Day, and 7 out of the first 10 results are for stories about different boating accidents that involved casualties, you know it wasn't a banner weekend for boating safety.